I love the snow. I can’t believe we’re expecting the biggest snow this season on Monday and I will be missing it! Instead, I will be with 14 awesome seniors and two colleagues (one of whom is my hubby!) sweating, teaching, learning, guiding and exploring in Ghana. To put more emphasis on something in Ghana, you add an “o” to the end of it. ie: really, really, REALLY hot becomes hot-o. Or, we’ve had a lot of snow-o this year. Having lived in Ghana for a year when we started Heritage Academy, I learned to pick up some of the local dialect. There is nothing like seeing the look on local’s faces when I fling a little Fante. I slipped back in to Ghana dialect on the phone tonight when talking with Kwesi. It made me excited to see friends and family again and share the experience with our seniors. It never ceases to amaze me how much Heritage has gown in just under 10 years. Heck, I can’t believe it’s BEEN just under 10 years-o! I was wowed two years ago when I went and saw the high school for the first time. I can’t wait to see what awaits me this time. There’s a simplicity to life in Ghana that I long for here. Yes, It’s frustrating at first when the light goes off in Ghana, but once I remind myself to just kick back and relax and be in the moment, it actually feels like a luxury in a way. Believe it or not, I’m looking forward to putting my phone down and not checking email, texts, Facebook and Candy Crush. The human connection and simplicity are what awaits us. Bananagrams, here we come! While I’m not a fan of heat and sweating-0, I can’t WAIT for the first step off of the plane in Accra when the Sub-Saharan heat hits you in the face and then the smell of things burning in the air blows by. If I could bottle those feelings and sensations, I would-o. 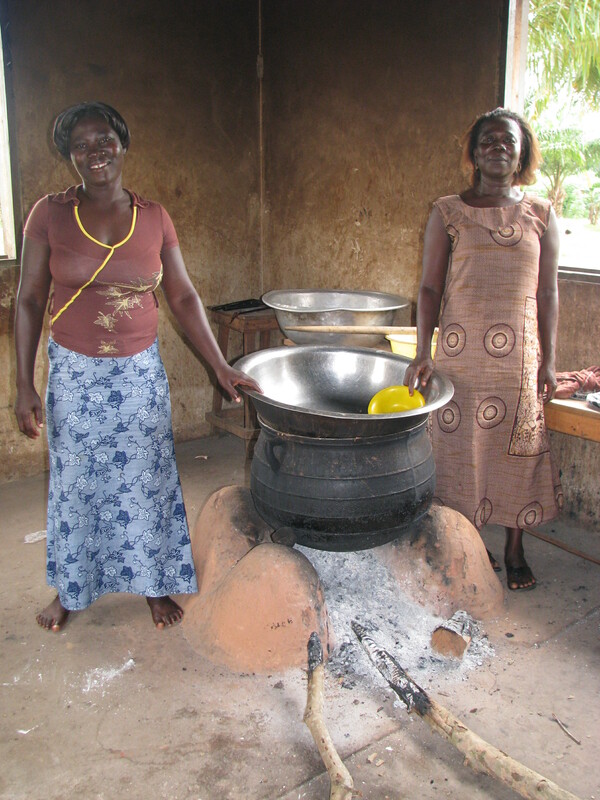 (Above photo is two of the three cooks at Heritage. Every day they provide a hot meal for about 1300 students).